No matter what the decade, Coney Island has tempted countless artists and photographers to walk through its doors and discover for themselves why it has had a mythic hold on the minds of so many, for well over a century. 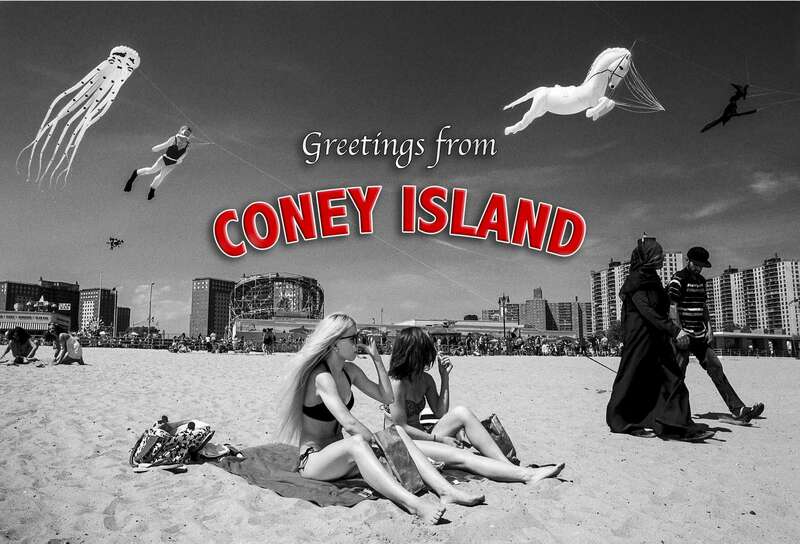 The secret is quickly revealed; although Coney Island is ever-changing, a constant remains. The multitudes, regardless of their backgrounds, ethnicities or social strata, continue to charge the air with a bustling energy; an energy, that, when mixed with land and sea, creates a seemingly endless potential for new expression. “Greetings from Coney Island” is a group exhibition featuring the work of 28 photographers documenting the iconic beach and boardwalk. Images celebrate the culture, characters and events of the beloved Brooklyn landmark, such as the Mermaid Parade and Polar Bear Swim, as well as everyday life in and around Coney Island throughout the years. This exhibition does not strive to show the bizarre or outlandish, but rather the vigorous spirit of all who frequent the locale—be it a group of young men playing volleyball in the ocean, a cheese-doodle-stealing seagull on the run, a young boy making a snow angel, or a full moon about to kiss the pier. For inquiries about print sales or to commission work from a photographer, please refer to the contact information listed in the artist's gallery or via his/her website.